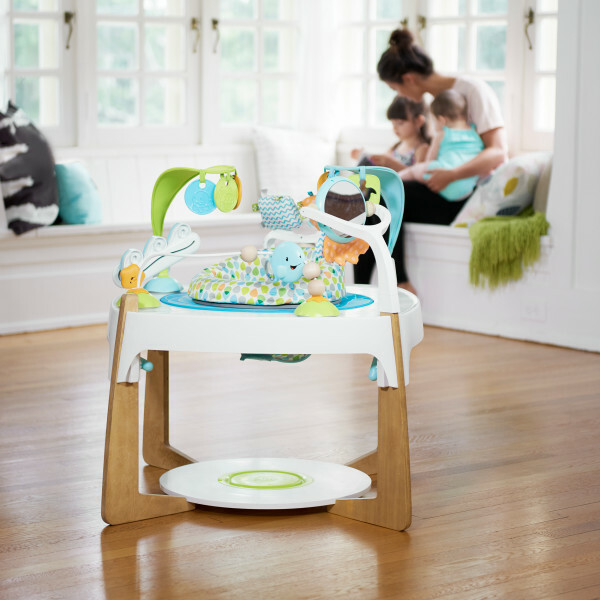 The ExerSaucer® Gleeful Sea delivers multiple stages of excitement for your little one– bouncing activity center for baby, stand-and-play table when your child is cruising, then art and activity table for the toddler years. Your child will love the 20+ activities and you will love the wood accents and sleek design that complement your home décor, as well as the four years of use! 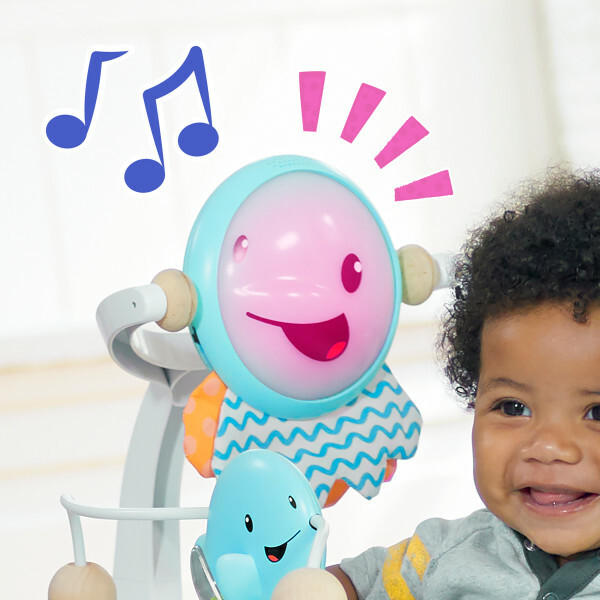 The ExerSaucer® Gleeful Sea delivers multiple stages of excitement for your little one– bouncing activity center for baby, stand-and-play table when your child is cruising, then art and activity table for the toddler years. Your child will love the 20+ activities and you will love the wood accents and sleek design that complement your home décor, as well as the four years of use! There’s an ocean of playtime in the toy-ﬁlled tray, with lights, sounds, self-discovery mirror and a full 360-degree spin. 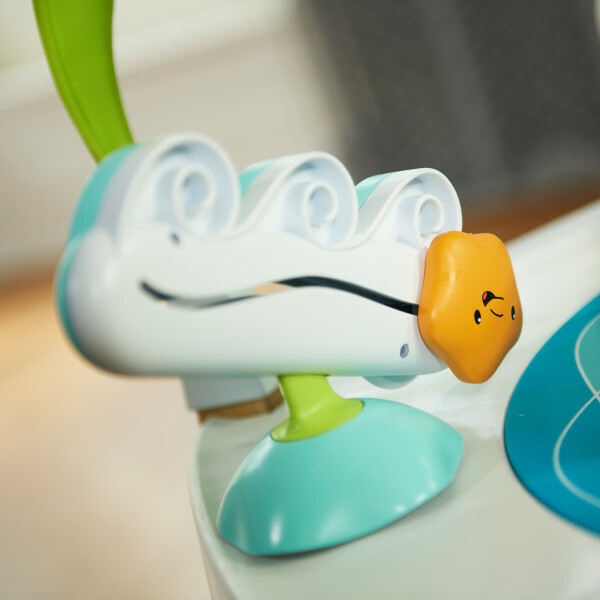 Designed with innovative suction bases that easily lock and unlock as needed, Spin-Loc™ Toys offer more play– on and off the tray! Simply turn-to-attach or detach and use on a variety of smooth, ﬂat surfaces to keep playtime going in the home and on the go. 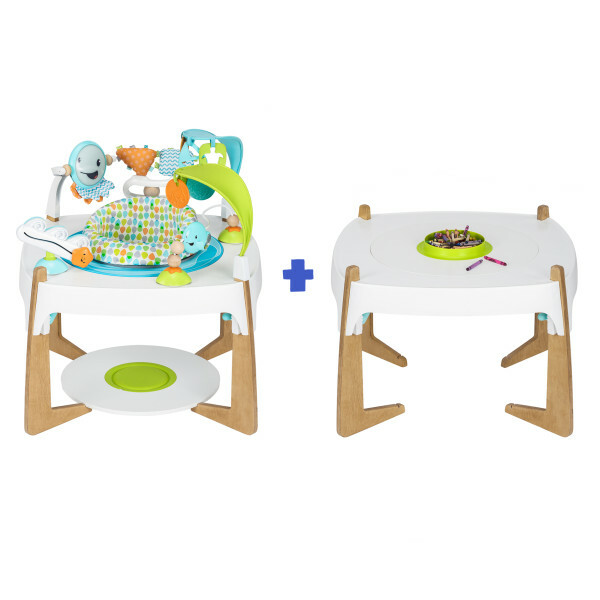 Three settings allow you to adjust the table height to enjoy more bouncing as child grows, and you’ll love that the seat cushion is machine-washable and toys are easy to clean. 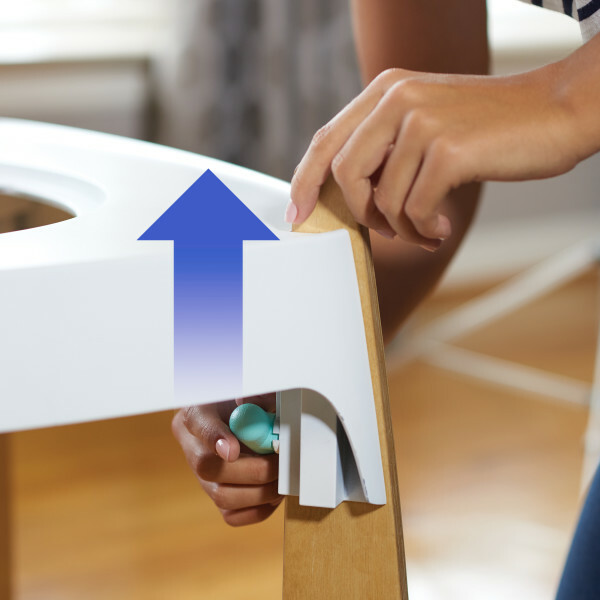 As your child begins to cruise, replace the bounce ring with the base so your little one can stand and move around the table to play with the toys. 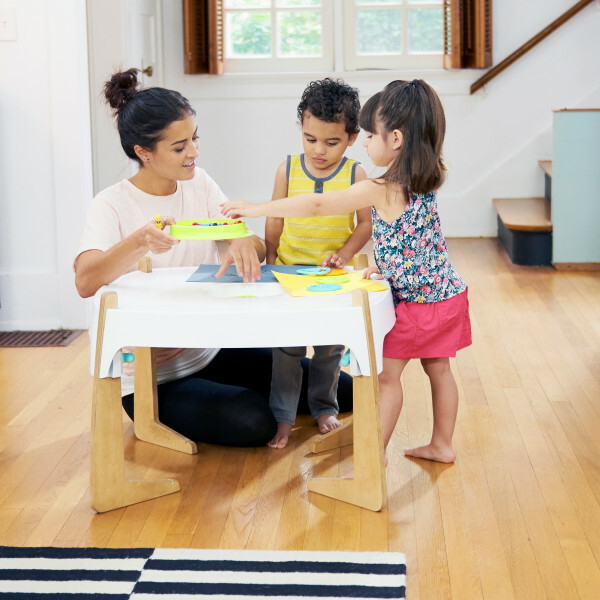 When your child is ready, the Gleeful Sea table becomes an art and activity table. Hanging toys remove to become stencils for tracing and the convenient center caddy is great for other art supplies, toys and snacks. Maturity: Activity Center for use with children who can hold up head and neck unassisted. Do not use stage 1 for children who can walk. Bouncing activity center to art table as they grow, up to 4 years of use. Activities stimulate fine motor skills, hand-eye coordination and core muscle development for wiggly, giggly learning fun. Wood accents and a modern style complement your home decor, making it more than just a toy! Reaching, turning and stretching are all a part of your child’s development. The full-seat spin provides all-around fun! Take their favorite toys with them! 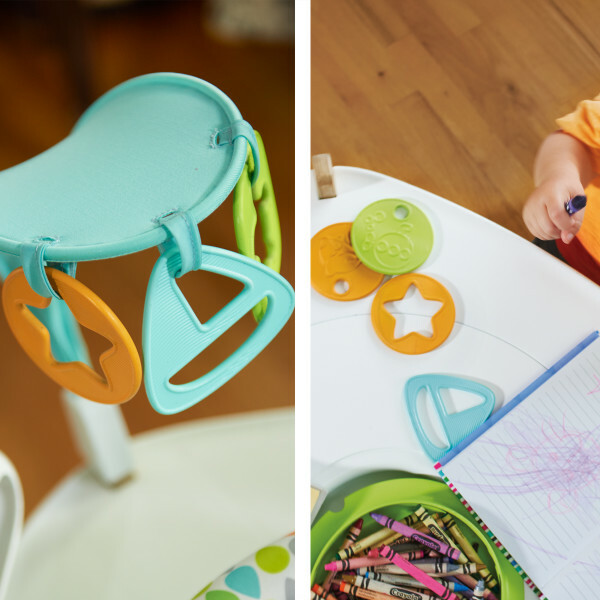 Innovative twist method makes it easy to attach/ detach the toys to any smooth, flat surface. 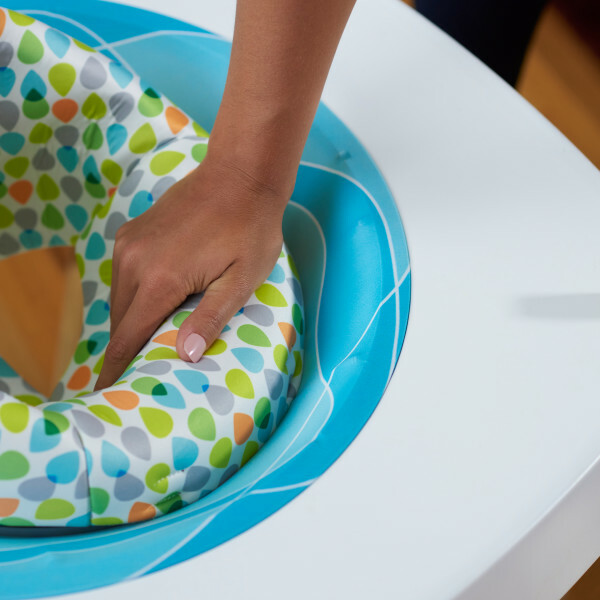 Uniquely designed bounce ring provides a smooth, quiet bouncing action. A new exer-awesome way to bounce! Easy to adjust, the 3 positions give your child more opportunity to bounce and play as they grow. 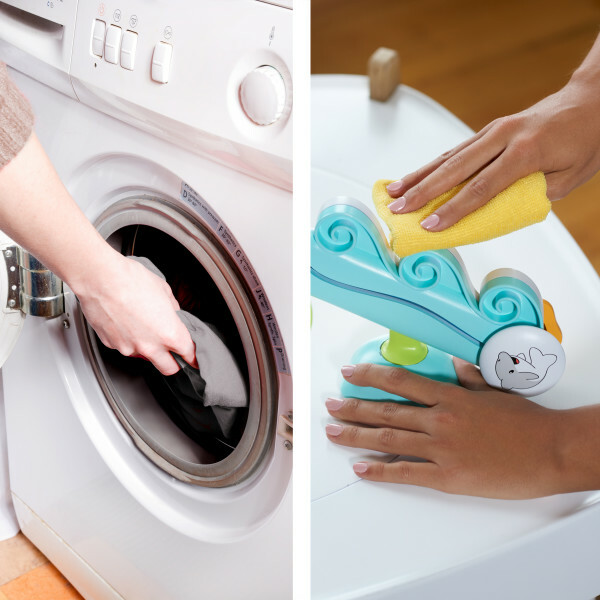 Machine-washable seat pad and wipeable toys allow you to keep the play area clean. Octopus lights up, giggles and plays music when child plays with it. The crinkle fabric tenticles add extra sensory stimulation. Flip the octopus over to discover a mirror that lights up. Children love seeing their own reflection! 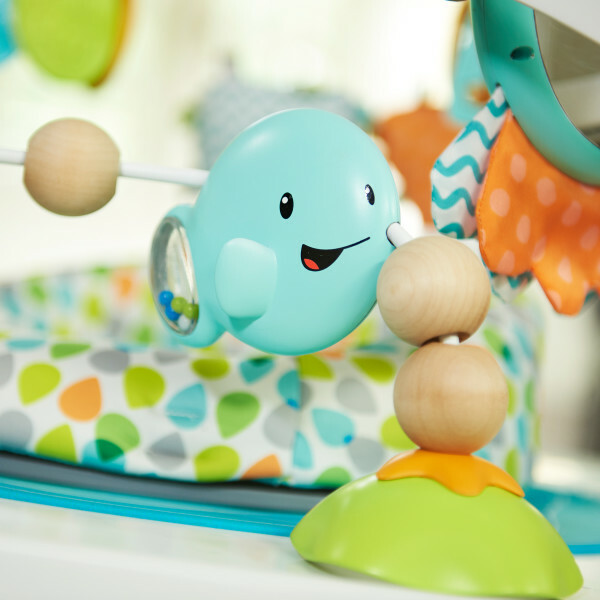 Hanging teether toys promote reaching and stretching, helping to build spine and neck muscles. 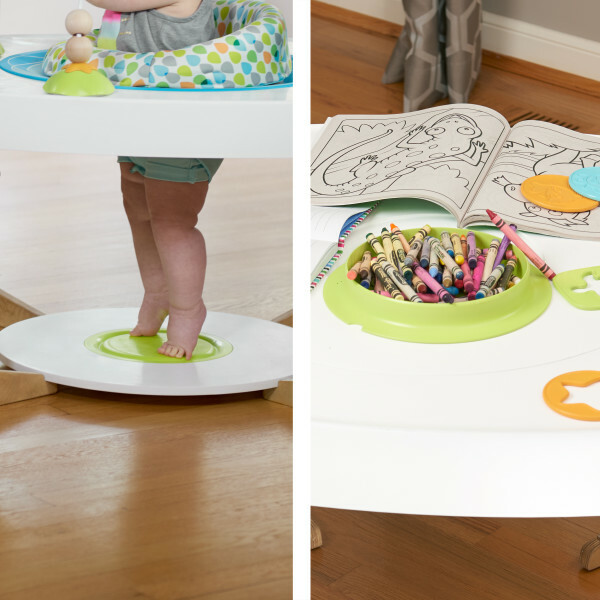 The bounce base from the activity center converts into a caddy dish for the art table. Store your art supplies or snacks for easy access! Dolly the dolphin and Sammy starfish playfully spin from one end of the wave to the other. Your child can play with you or friends at the table! Multi-side design and flat surface are great for creative play options. 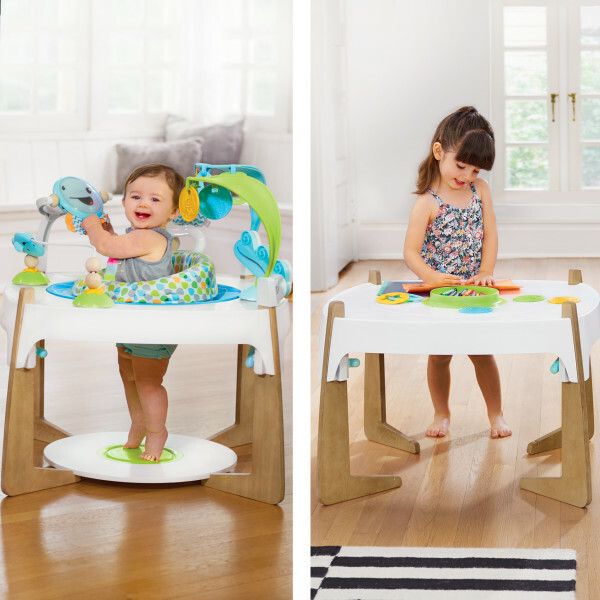 The ExerSaucer® Gleeful Sea delivers multiple stages of excitement for your little one– bouncing activity center for baby, stand-and-play table when your child is cruising, then art and activity table for the toddler years.